"Ourselves or the Freemasons or the Church — there is room for one of the three and no more... We are the strongest of the three and shall get rid of the other two." Adolph Hitler considered Freemasonry a threat, as he did any group that "mistakenly" taught that all men were equal and encouraged independent thought. When Hitler rose to power, he set out to destroy his perceived enemies--the Freemasons high on his list. The ten Grand Lodges of Germany were dissolved, and many prominent members of the fraternity were sent to concentration camps as political prisoners. Freemasons were targeted by the Gestapo--membership lists of the Grand Lodges were seized and Masons had their libraries and collections of Masonic objects looted by the Gestapo. Many of these objects siezed were exhibited in an "Anti-Masonic Exposition" inaugurated in 1937 by Herr Dr. Joseph Goebbels in Munich. The same thing happened in Austria when the country was captured by the Nazis. The Masters of the various Vienna lodges were remanded to some of the most notorious concentration camps, including the Dachau in Bavaria. Then it happened in Czechoslovakia, then Poland . . . Holland . . . Belgium . . . Norway . . . In Spain, General Franco in 1940, sentenced all Freemasons to ten years in prison as soon as they were identified as members of the craft. When France fell to the Nazi's, the Vichy government caused the two Masonic bodies of France--the Grand Orient and the Grand Lodge of France--to be dissolved, and all their property was sold at auction to fuel the Nazi war machine. As early as 1934, Freemasons in Germany knew they were suddenly at tremendous risk--many went underground. 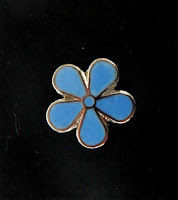 They left their traditional symbols, like the square and compass, and adopted one in its place the Nazi's wouldn't recognize--a small blue flower called a Forget-Me-Not. It was common at the time--a pin given to those that had given to a charity (much like the orange poppies given out today by the American Legion Auxilliary when you offer a donation to them). But that flower came to mean much more to underground Masons in Germany at that time. By this flower, and perhaps a handshake, Freemasons were able to identify each other in public, and in concentration camps. 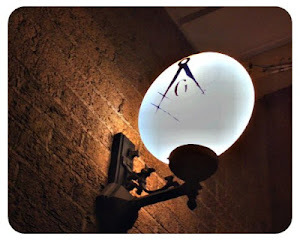 It was worn by Freemasons who stubbornly refused to allow the light of Freemasonry to be extinguished by the Nazis, and by that symbol, Freemasonry emerged again from the semi-darkness of World War II to thrive again. The number of Freemasons who were killed by the Nazi's in not precisely known, but it is estimated that between 80,000 and 200,000 Freemasons were murdered by the Nazis. Many Freemasons throughout the world still wear the small blue flower pin, in memory of those Brothers who died at the hands of the Germans. Those tiny pins are still widely available--now that you know what it means, maybe you should get one in remembrance of a time when your "hobby" might very well have cost you your life. It was not so much a hobby with those in Europe during World War II--it was something worth preserving, even at the risk of their own lives.